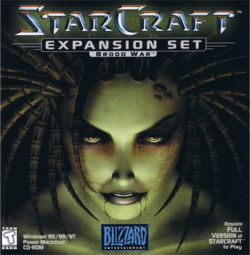 StarCraft: Brood War is an expansion pack released in 1998 for StarCraft — an award-winning real-time strategy game. It was co-developed by Saffire and Blizzard Entertainment. Brood War takes place in the StarCraft universe, set around the early 26th century. Terran exiles from Earth have colonized a distant area of the Milky Way galaxy called the Koprulu Sector, having established several governments. Eventually, a civil war breaks out and ends with the formation of the Terran Dominion. However, humanity soon becomes caught in a war between the Protoss and the Zerg, which culminates at the end of StarCraft with the death of the Zerg leader, the Overmind, on the Protoss homeworld of Aiur. Without the Overmind to command, the Zerg rampage mindlessly across Aiur, while the cerebrates—the secondary commanders of the Swarm—attempt to regain control. After the discovery of alien life in the Koprulu Sector, the United Earth Directorate (UED)—the international body governing Earth—decides to send an expeditionary force to secure the sector and prevent the aliens from finding Earth. Brood War begins two days after the conclusion of StarCraft. This page was last edited on 16 August 2016, at 15:20. This page has been accessed 250,715 times.